In the townhouse community in which I live in Northern Virginia, many of us have crabapple trees in our front yards, and the fallen crabapples are a nuisance at this time of the year. 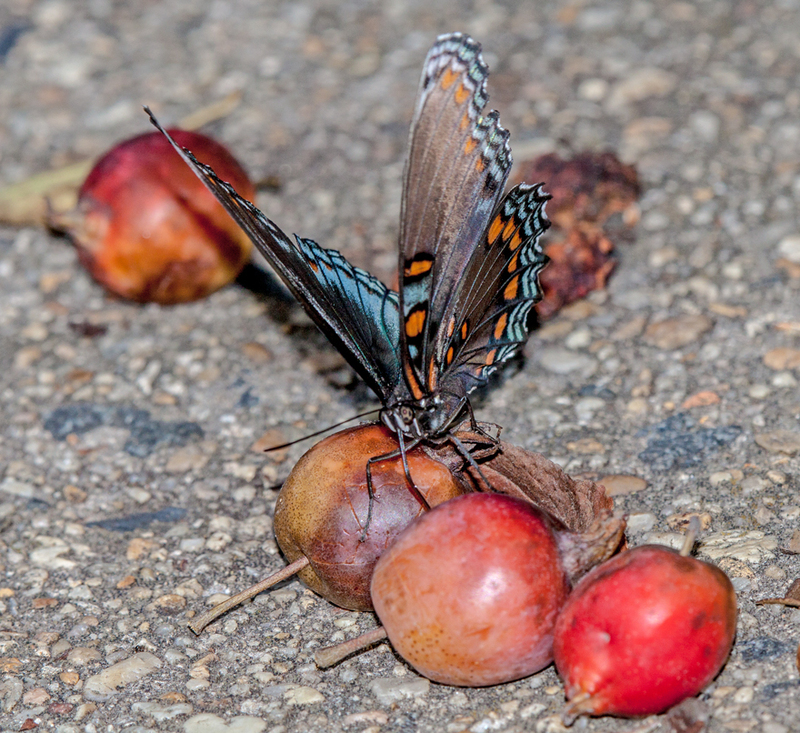 However, they do provide food for certain butterflies that prefer rotten fruit to flower nectar, like this Red-spotted Purple butterfly (Limenitis arthemis astyanax) that I photographed this morning. If you were an insect or even a hummingbird, you would definitely not want to encounter this large insect with the macabre moniker of Red-footed Cannibalfly (Promachus rufipes), also known as the Bee Panther. 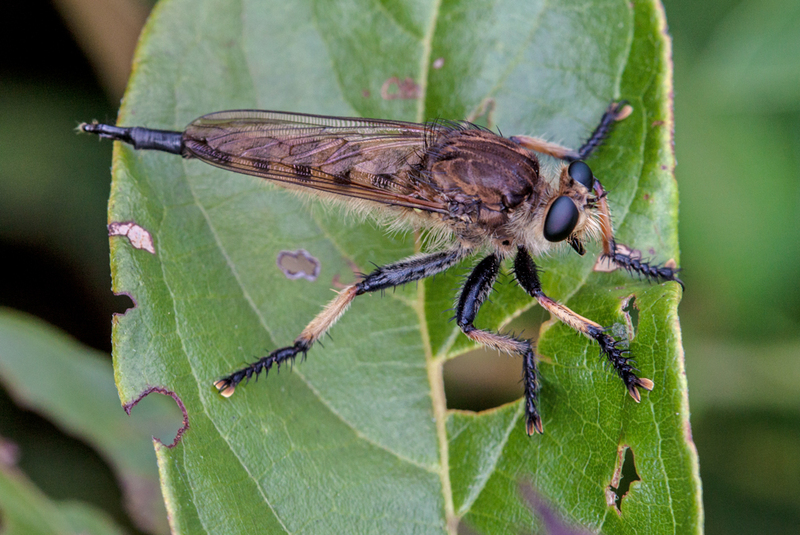 It’s hard to believe that a fly could actually take down a hummingbird, but bugguide, which I have found to be a good reference for insects, notes that there have been reports of a Red-footed Cannibalfly attacking a Ruby-throated Hummingbird. 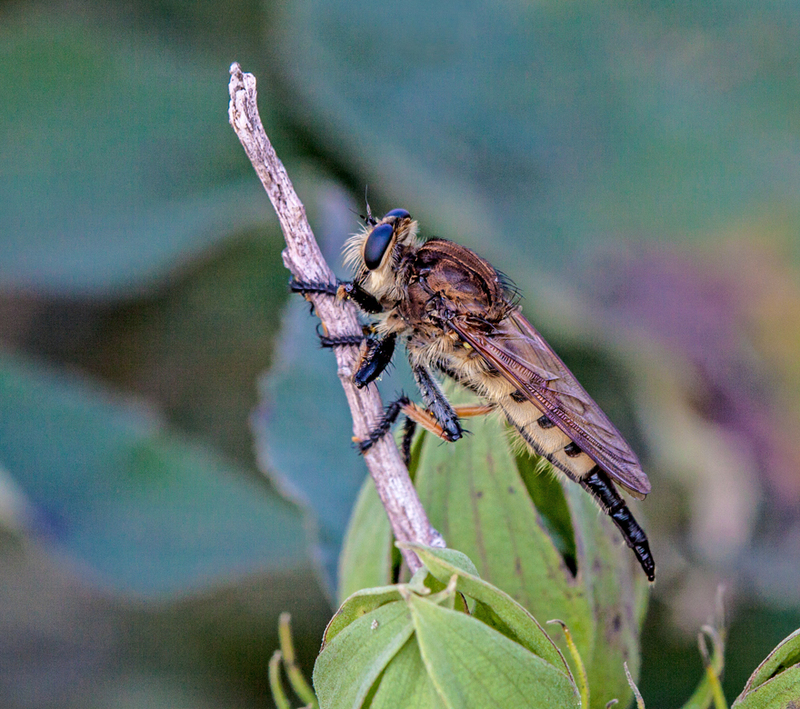 When I first saw this insect fly by, I thought it was some strange kind of hairy dragonfly, but the more that I looked at it, the more I realized that it was not a dragonfly—the eyes and wings were all wrong. I have spotted several of these flies already, but so far have not seen any with captured prey. 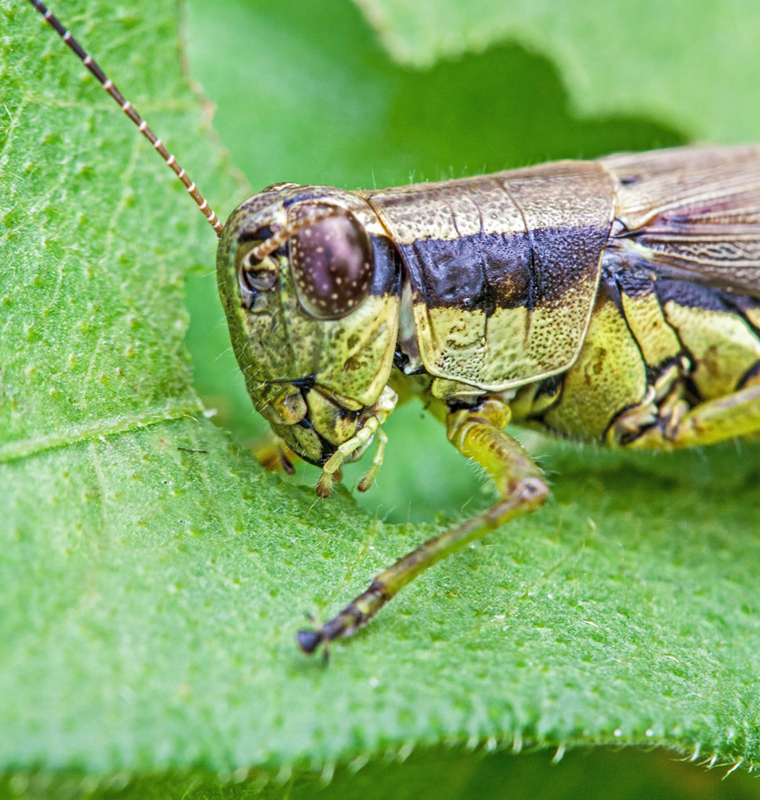 My goal for this photo was pretty simple—move slowly toward this grasshopper and get a good close-up shot. I think that I achieved my goal. I love shooting with my macro lens. 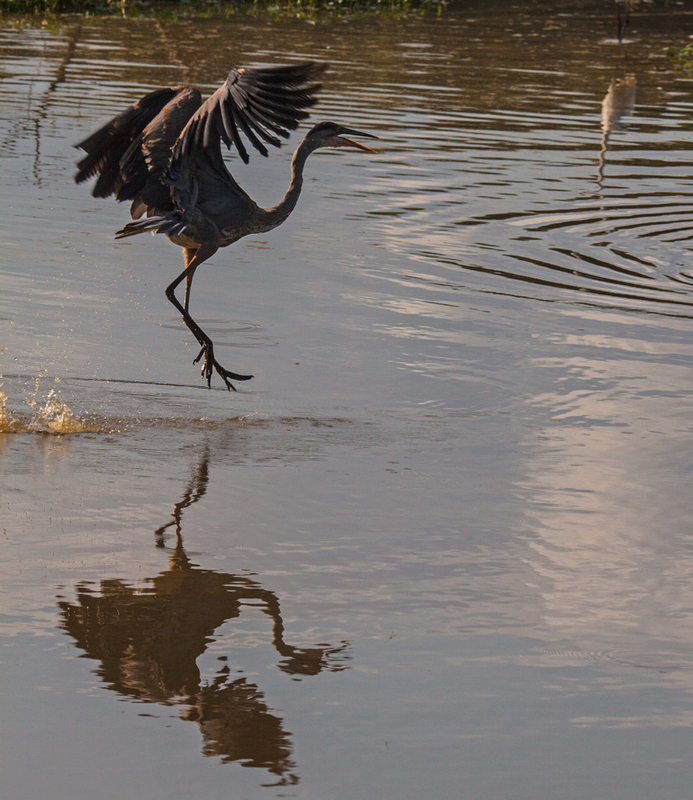 Without fill-in light, a backlit subject is often in the shadows and becomes a silhouette, which is what happened in these shots of a Great Blue Heron taking off from a watery area of my local marshland park. 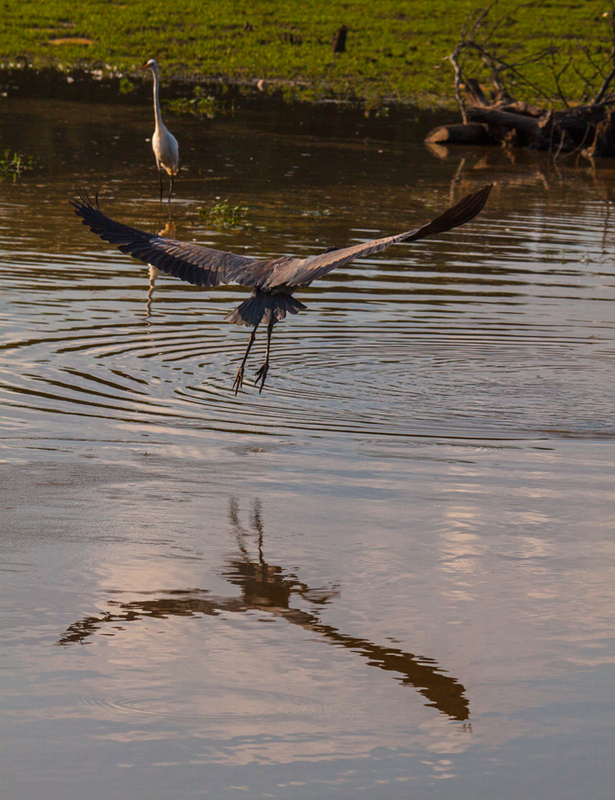 The same sunlight in front of me also created beautiful reflections of the heron in the water, and I really like the combination of the silhouettes and reflections in these images. 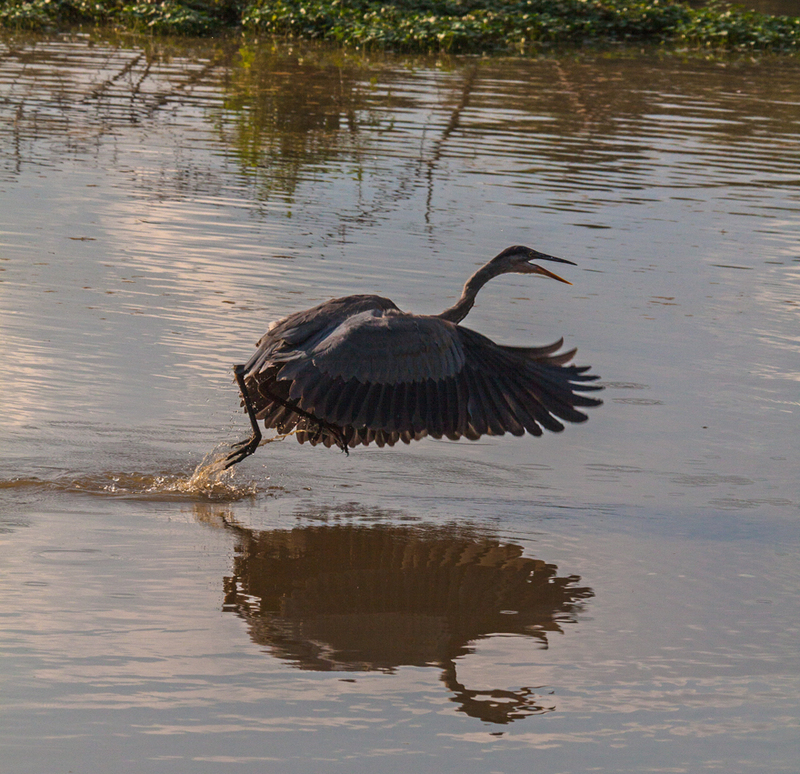 This heron was getting ready to give chase to another blue heron and was squawking loudly as it took off. I watched the two herons for quite a while and this one went out of his ways several times to harass the other one and force it to search for prey in the vegetation away from the pool of water. As you can see in the second and third photos, a Great Egret was a spectator to the action, lifting up its head to observe what was going on. When things calmed down, the egret returned to its fishing until the next round of activity from the herons. 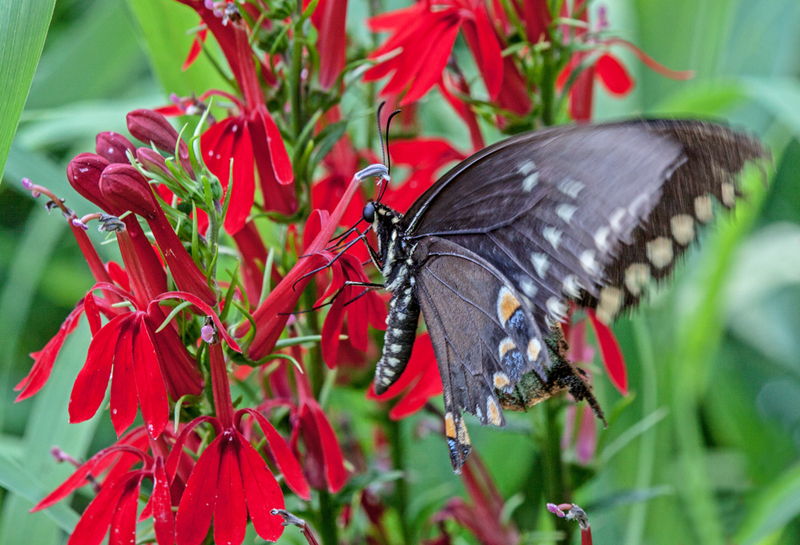 I love the look of this black-colored swallowtail butterfly feeding on a cardinal flower (Lobelia cardinalis) in the marsh—I just wish that I could identify the butterfly with greater certainty. I used to think that there were only a few varieties of black-colored swallowtails, but as I learn about more species, I get more confused when trying to identify them. 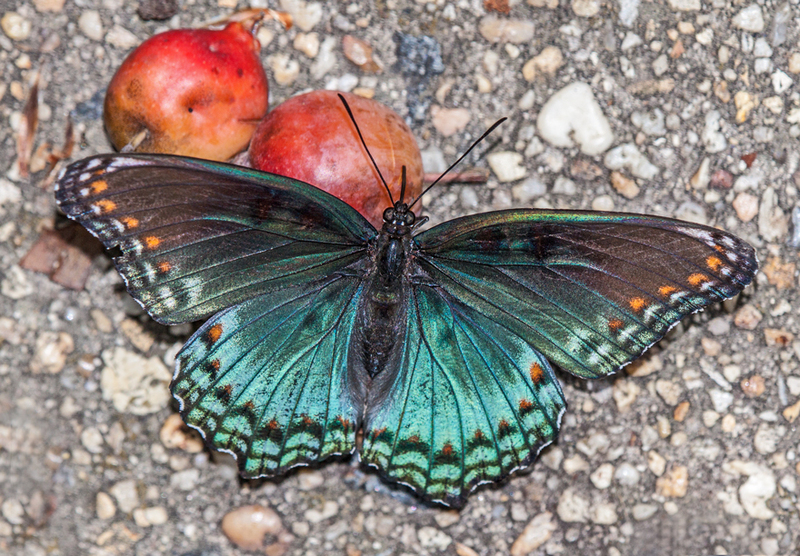 Most of the time I think that this is a Pipevine Swallowtail, but at other moments I convince myself that this is a Spicebush Swallowtail or even a Black Swallowtail. Whatever species it is, this butterfly kept its wings flapping pretty quickly as it was feeding, which accounts for the motion blur in the wings. I really like the color and shape of the cardinal flower and wanted to show some of the buds and petals, so I decided not to crop the shot any tighter. I was a little surprised to find this butterfly on the cardinal flower, because I read in one document on the internet that these flowers are pollinated almost exclusively by hummingbirds. 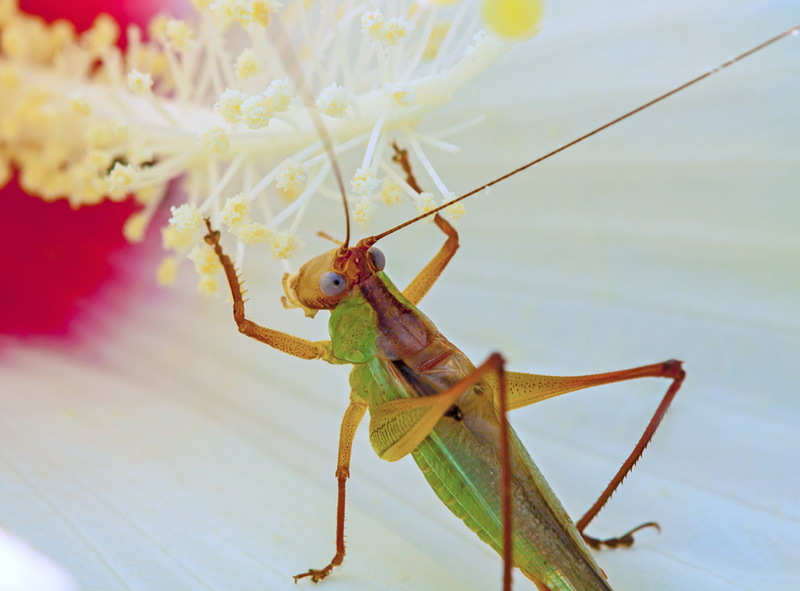 Looking into a Swamp Rose Mallow (Hibiscus moscheutos), I immediately noticed the distinctive colors of a Handsome Meadow Katydid (Orchelimum pulchellum), feeding on the center stalk of the flower. The katydid did not move from its position and merely cocked its head a little to the side and glanced up at me with its striking blue eyes. It seemed to be a little irritated to be disturbed, though I must confess that it’s really hard to gauge the emotions of an insect from its expressions. The Handsome Meadow Katydid is one of my favorite insects and, in my humble opinion, truly deserves its name. In addition to its rainbow coloration and distinctive eyes, it has the cutest little feet and toes. 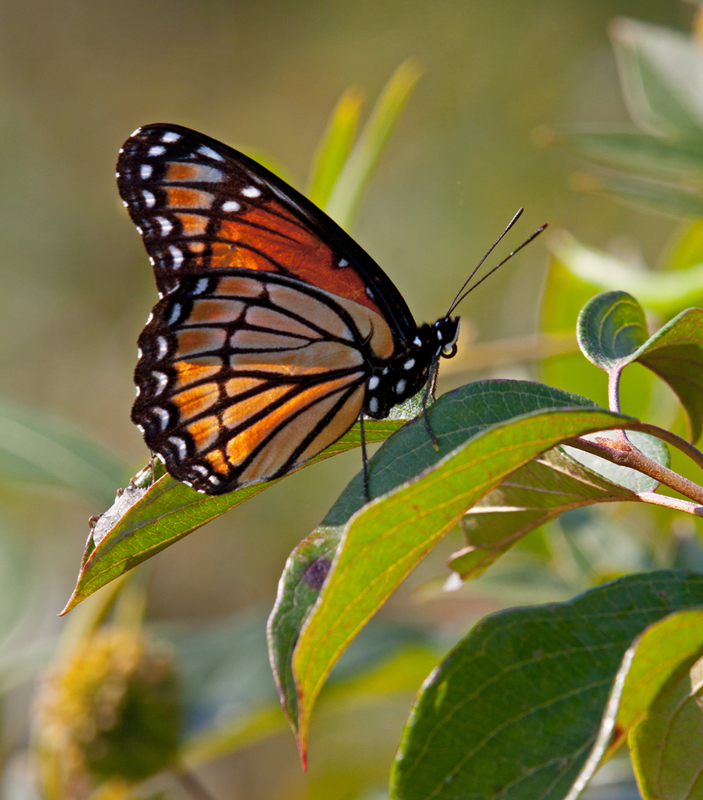 I love backlit subjects, especially when the light shines through from behind and provides a stained glass effect, as was the case with this Viceroy butterfly (Limenitis archippus).